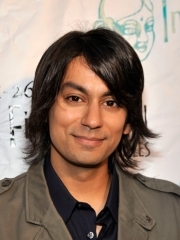 Vikram "Vik" Sahay is a Canadian actor best known for playing Lester Patel, a member of the Nerd Herd in the NBC television series Chuck on which he became a series regular from the second season, and Rama in the Roxy Hunter Saga. Vik Sahay was born in Ottawa, Canada to Indian parents and attended Canterbury High School of the Arts in Ottawa. He went on to study Theatre Performance at Montreal's Concordia University. He learned to perform Indian classical dance with his brother Sidharth Sahay, with whom he appeared on 1986's You Can't Do That on Television. He was also featured in the television series Radio Active, playing sportscaster Kevin Calvin. Based on that work, he was selected to appear in Our Hero as Dalal Vidya, for which he was nominated for a 2002 Canadian Comedy Award. Subsequently, he also portrayed attorney Anil Sharma on the CBC series This is Wonderland during its second and third seasons. Wings of Hope, The Rocker, Amal, and Afghan Luke. He currently portrays Lester Patel on the television series Chuck. He is currently working on American Reunion where he is playing Stifler's Boss. Whole or part of the information contained in this card come from the Wikipedia article "Vik Sahay", licensed under CC-BY-SA full list of contributors here.